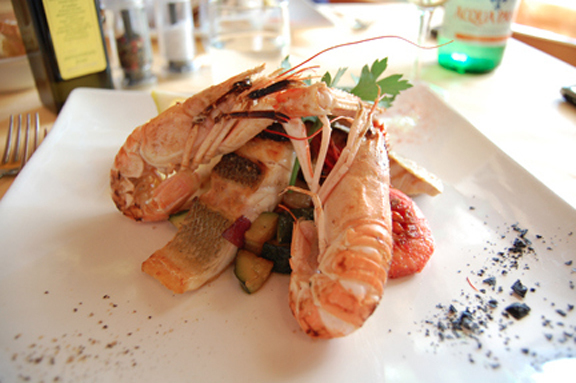 Above: Some of Italy’s best seafood is found along the Tuscan coast. That’s one of the reasons that Mazzoni winemaker Alessandro Bindocci created his Vermentino-Chardonnay blend. But what so many of us don’t realize is that Tuscany is also home to some of the greatest seafood and fish restaurants in all of Europe. After all, the entire western border of Tuscany lies on the Mediterranean sea and the region is also home to one of the most important ports of southern Europe, the city of Livorno. All along the Tuscan coast, you’ll find wonderful little towns and villages, each with their favorite seafood spot. Like many Tuscans who live inland, Mazzoni winemaker Alessandro Bindocci takes his summer vacation on the Tuscan seaside. His love of the Tuscan riviera and his passion for its seafood led Alessandro to create his Mazzoni Vermentino-Chardonnay blend, made from grapes grown in the hills along the coast. This entry was posted on November 19, 2013 by Terlato Media. It was filed under LIVE LIKE AN ITALIAN .